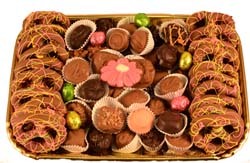 If you want to be the toast of the party -- here's the ticket: a wonderful chocolate party tray from Dorothy's. Our hand-crafted chocolates are sure to wow -- and each try comes with a hand-painted piece for that WOW factor you can't get anywhere else. Hand-crafted pretzels celebrate the season with a pop of color. Our trays our so beautiful you won't want to eat them. But then you will!